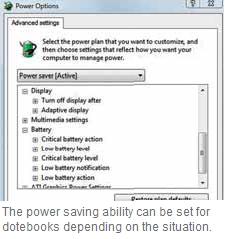 Proper settings to save battery power allow longer battery runtime, making daily computing chores seamless. In XP, go to 'Control panel | Power Options', and there you’ll fi nd various power schemes like Portable/Laptop, Presentation, etc. In Windows 7, go to 'Start | Control Panel | Hardware and Sound | Power options'. You’ll see two main power options - High Performance and Balanced. You can even customize your own power option. When you click on ‘Change Plan Settings’, you’ll notice a number of options. For instance, you can set the monitor brightness, its turn-off time, and make changes to the energy saving mode. In the ‘Change advanced power options’ window, there are drop down menus for each option. You can specify what must happen if you close the laptop lid, or push the power button, or after how much time the laptop should go into hibernation, and so on. These options can be very useful when you leave your laptop unattended, but automation has its downside too. For instance, if you’re recording a video or downloading data and the laptop automatically shuts down, it can be irritating. Nonetheless, these settings can be changed with very little eff ort and in a few steps. You need not make changes to all the settings, and use only what concerns you, such as turning off only the monitor when the downloads are on.